This itinerary is suitable for individuals and small to medium groups. For larger group sizes of 40 or more, please contact us for additional options. Fly to Anchorage and land at Ted Stevens Anchorage International Airport. From there you can rent a car or make prior arrangements for a shuttle and head straight to the Mat-Su Valley via the Glenn Highway. Begin your day with a visit to Iditarod Sled Dog Race Headquarters for a glimpse into the history of the Iditarod Sled Dog Race. Stop at the Dorothy Page Museum or the Museum of Alaska Transportation and Industry for more information on Alaska's fascinating history. Proceed to Talkeetna, a quaint town that serves as the jumping off point for Denali climbing expeditions. This morning explore the backcountry roads of Trapper Creek and Petersville Road. 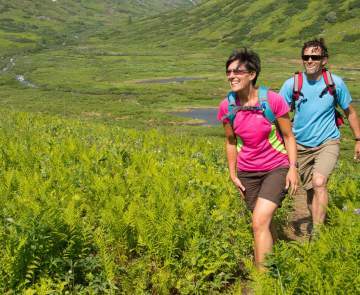 Take a guided tour into Denali's backcountry, an area rich in gold-mining history, wildlife and scenic wonders. This afternoon choose from a variety of optional activities - river rafting, jetboat safari, or Denali flightseeing. Continue south to Willow where you will take an alternate route to the Hatcher Pass/Independence Mine State Historical Park. Once a gold mining area, Hatcher Pass is known for its abundant scenery and as a local playground for outdoor activities. Begin your morning meeting some of Alaska's oldest residents at the Palmer Musk Ox Farm. Learn about how the underwool of these magnificent animals is woven into qiviut, a fiber that is warmer than wool and finer than cashmere. Continue north on the Glenn Highway to the Matanuska Glacier. 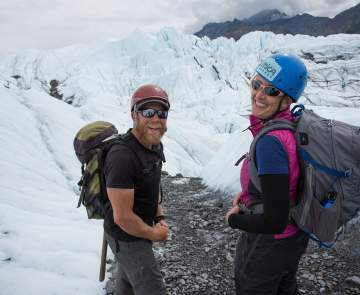 Get a closer look at this incredible mass of ice on your guided glacier hike. Get your day off to an exhilarating start with a white water rafting trip on the Matanuska River. Afterward, head south to the Palmer Visitors Center where you may see some of the local produce the Mat-Su Valley is known for and photos of the world record-breaking vegetables that are grown in this region. On your way back to Anchorage, take the scenic route via the Old Glenn Highway. Stop by Pyrah's Pioneer Peak Farm to pick your own veggies or take an exhilarating helicopter or ATV tour to see the Knik Glacier.